Here is the awesome pheasant recipe prepared by students from the Blackhawk Technical School Culinary program for a dinner they prepared at the Armory, October 9, 2018 in Janesville, WI. This delicious recipe has some ingredients that may need a little explaining so I checked with Culinary Program Assistant, Rob Patrick for some definitions. If cooking professionally interests you, the Blackhawk Culinary Program offers exciting and challenging one and two year programs. We are very excited at MacFarlane Pheasants to begin selling edible pheasant eggs (not fertilized) in our store in Janesville. They are also offered online and will soon be offered in gift packs from our website. Why choose pheasant eggs? First of all, they are delicious, richer than a chicken egg, and not requiring as much seasoning to get a fabulous taste! Here are some other things you might think about before you place your order. The Empty Bowls Fundraiser is a yearly event sponsored by ECHO, Inc. They have been around since 1969 and are a non-profit, faith-community sponsored charity. ECHO stands for Everyone Cooperating to Help Others. Their mission is to meet housing, food and other basic needs for those in need of a hand up to self-sufficiency. There are so many choices for soup makers who love pheasant meat. Our free recipe book features just five of them, but if you have a favorite soup recipe, I encourage you to substitute pheasant meat for any meat you have used in the past. Pheasant meat (3.5 oz.) has only 133 calories and is high in iron, B6, B12, niacin, selenium, and phosphorous. Phosphorous is the mineral that works with calcium to help with bone strength. I have included one of MacFarlane’s easiest recipes in this post so that you can experience this delicious and nutritious soup maker’s dream! Tis the season to make a meal from sandwiches after a fun day away from home enjoying this beautiful summer weather. MacFarlane Pheasants’free recipe book includes both of these pheasant lover’s recipes. The first recipe is a traditional sandwich and the fajitas are less traditional, but oh so delicious. In addition to being so tasty, one half of a cooked pheasant breast is only 242 calories and has 44.35 grams of protein. The fat contact is 5.92 grams, and the pheasant breast contains 5% of the recommended allowance of vitamin A and 18% of the recommended allowance of vitamin C. If you are watching your carbs, there are 0 carbs in skinless pheasant. Enjoy these nutritious and scrumptious pheasant treats and please download our cookbook for more pheasant recipes. MacFarlane Pheasants sells pheasant in many forms from whole pheasant to specialty bratwursts. This specialty artisan meat is a healthy, natural choice for individuals, restaurants, and grocery stores. Each year, more people realize how delicious and enticing pheasant can be as a center of the plate dish. As customers have recognized that pheasant can be a healthy year-round dish, they have bought more pheasant! That is the simple explanation for sales growth. Smoked pheasant has been around since cave man days! It is a wonderful way to preserve meat and enhance the flavor. Many hunters love to follow a successful hunt with smoking hot pheasant. This recipe is an awesome way to get the job done! Following the recipe, I will provide a link for those of you who would like to purchase your smoked pheasant from MacFarlane Pheasants, Inc. It is the perfect solution for those of you who want to enjoy this taste year-round! Pheasant with Rice and Cranberry Grilling Sauce is Yummy! If this is your first time preparing a whole pheasant and you want to make sure you have a beautiful side dish and sauce, without even giving it a second thought, you can purchase MacFarlane Pheasants’ whole pheasant that includes the fabulous Rice River Farms Wild Rice and Cranberry Grilling Sauce. Just click on the whole pheasant link to purchase. All you have to do is add any fresh vegetable you love. We especially enjoy asparagus with this meal. The heavenly Pheasant Carbonara, in this recipe, was adapted from the famous Ovens of Brittany Cookbook. The author, Terese Allen, was a chef and manager at many popular Wisconsin restaurants. In this wonderful cookbook, she shares both recipes and stories from her experiences. If you want to shake things up a bit on Easter Sunday, I would recommend a Peking Duck from MacFarlane Pheasants. Succulent duck is naturally moist, flavorful and delicious. It is great for roasting in the oven or on the Weber grill! The duck recipe I will be sharing is included in our recipes for other game meat and is prepared in the oven. Chestnuts and wild rice add a delicious stuffing for this exquisite duck dinner. The rice and duck can be purchased online or at our retail store. If you would like to try our recipes for other wild game we sell, check out game meat on our website at pheasantfordinner.com. Download our free cookbook and enjoy some meals you won’t easily forget! Barbecue Pheasant and Gouda Pizza is one of the best appetizers I have ever tasted. It is so simple to make but a real crowd pleaser. We included this dish in our free recipe book along with many other delicious appetizers, entrees, salads and wild game dishes. Pheasant Barbecue Sandwiches Can Be Ready in 15 Minutes! I love ground pheasant and have shared my recipes for pheasant burgers, pheasant enchiladas, and spaghetti squash pheasant boats in our Pheasant For Dinner blog site in the past. Pheasant chili and many other delicious recipes can be found on our blog site and you can also download MacFarlane’s free Pheasant Recipe Book. Recently, a Sunday night supper included the easiest use of ground pheasant for a delicious 15-minute supper, I have ever experienced! I have to share it with you because it is just further proof that pheasant is not only low fat and delicious, but it can be a quick “go to” meat when you don’t want to spend a lot of time! 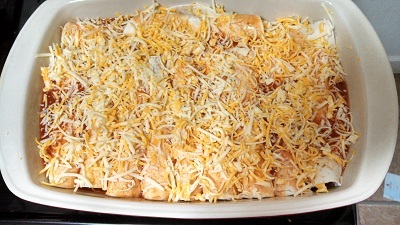 Ground Pheasant Enchiladas Are Amazing! MacFarlane Pheasant’s ground pheasant is any easy way to keep naturally low-fat pheasant on hand to prepare a yummy dinner for your family and friends. It freezes well and is a nutritious and tasty substitute for beef. You can purchase five pounds of ground pheasant in one-pound packages, either on-line or at our retail store, so you are ready to prepare our ground pheasant recipes. If you decide to try our pheasant in one of your own recipes, please share it on our Facebook page. We love hearing from customers after they try MacFarlane’s pheasant! Bill and Dori MacFarlane and their son Micah, recently attended a special event at Janesville, Wisconsin’s newest fine dining restaurant, Lark. Owners, Richard and Joan Neeno took reservations for this special event at their restaurant at 60 S Main Street and the house was full. You won't wonder why when I share the menu! Merry Christmas and best wishes for a healthy and prosperous New Year to all our MacFarlane Pheasants, Inc. friends. Christmas will soon be here, so we wanted to remind you that we have unique gift packs featuring many of our products. They make awesome appreciation gifts for your friends, clients, and employees and definitely add plenty of pizazz to your gift giving! 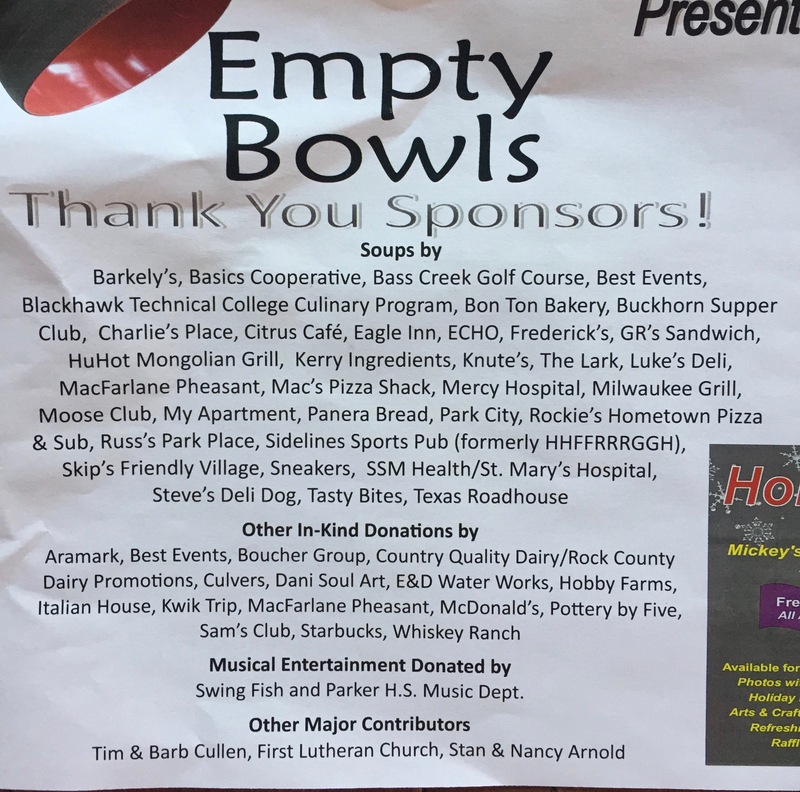 MacFarlane Pheasants, Inc. was honored to participate, with more than 50 local businesses, individuals and other community volunteers to support the Empty Bowls Event at Parker High School on October 28, 2017. Empty Bowls brought in 650 guests to enjoy the 34 soups, breads, desserts, pottery, and entertainment organized for this event. This is an annual event established to support Everyone Cooperating to Help Others (ECHO) and is an important fundraiser for all of the people served by this agency. Harvest time is such a wonderful time to add MacFarlane pheasant to a vegetable- filled meal. Last night, I used a very large spaghetti squash, a pound of ground pheasant and several other nutritious vegetables to make spaghetti squash pheasant boats. It was a total experiment, but I kept track of the ingredients, just in case it turned out to be delicious and a meal I would feel good about sharing! There is nothing more satisfying on a crisp fall day than grilled pheasant kabobs! These kabobs are crisp, because they are wrapped in bacon, moderately hot, because they are made with jalapeño peppers, and so easy to prepare! You can purchase MacFarlane’s pheasant breast in our store at 2821 South HWY 51 in Janesville, Wisconsin or order them online. You can also find our pheasant at most Whole Food’s stores located all over the United States. Once you get your pheasant, you are 45 minutes away from a delicious treat. You can get a free copy of our Pheasant Cookbook by downloading it from www.pheasantfordinner.com. When you download our cookbook you will find that it is filled with appetizers, entrées, soups and salads that feature MacFarlane pheasant. But first things first, let me share how easy it is to make pheasant kabobs. Let me begin by inviting you to attend the Empty Bowls event at Parker High School, 3125 Mineral Point Ave., Janesville, WI, on October 28, 2017, from 11:00 a.m.-2:00 p.m. Join us in supporting the fight to end hunger in our community. Please register online at Empty Bowls and join us at Parker High School on the 28th of October. Soups, artisan breads, beverages, desserts, and entertainment (SWINGfish and Parker High School Musical) will be provided at a cost of $8 for online tickets and $10 tickets at the door. Featured soups are provided by local businesses from all over Janesville. It never ceases to amaze us at the number of businesses in our community who share their resources to make this event a success. MacFarlane Pheasants has joined in this event for many years and is a proud participant. I experimented with MacFarlane’s ground pheasant this weekend and I couldn’t wait to share the recipe with all the pheasant lovers in North America and beyond! Here’s what you will need to prepare these burgers for four people! Here is the exciting part. Pheasant burgers do not shrink! A quarter pound burger when it begins cooking remains a quarter pound burger once it is done! If you have a lighter appetite you could make 5 or 6 burgers with this mixture. The food division at MacFarlane Pheasants is busy building an inventory of our most popular game bird items. It is only September, but many of our customers are planning ahead to order holiday gift packs for friends and employees. Other pheasant lovers are checking our recipes and ordering pheasant delights for special dinners during the holiday season. Recipes are also available within our www.pheasantfordinner.com web site. I have personally prepared each recipe/item mentioned in the blog and they were all delicious! There are so many times in my life when I want to prepare something delicious, but I don’t really want to cook. MacFarlane Pheasants has several non-cook choices in the retail and on-line store. The hickory smoked pheasant is so delicately flavored and scrumptious, you and your guests will wonder why you ever cook. It can be served warm or cold, as the main dish, in sandwiches, salads, and pulled off the bone like you are having a renaissance meal! 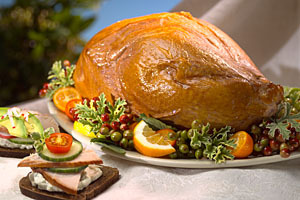 I like to enjoy smoked pheasant with fruit, cheese, sweet potatoes and my favorite wine! It is all about putting your favorite foods together for one relaxing meal. 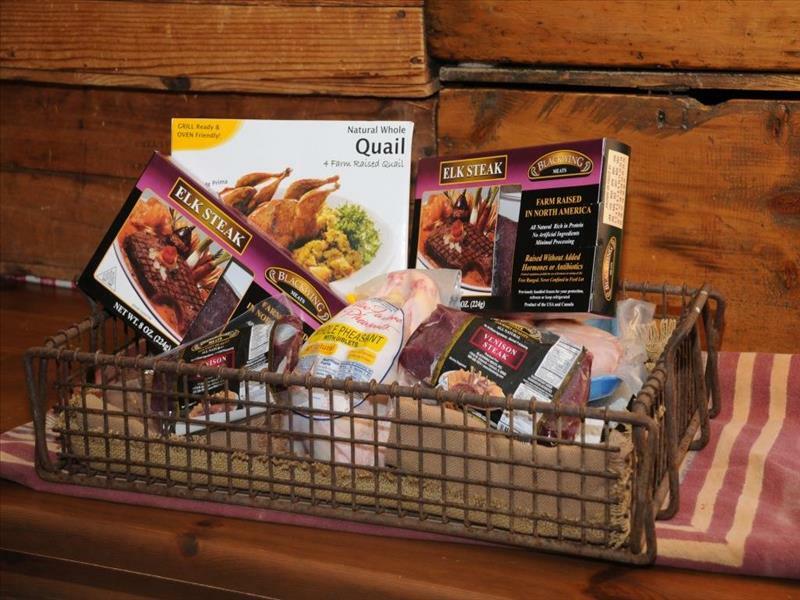 Gourmet Gift Packs from MacFarlane Pheasants, Inc. are the perfect way to show appreciation to business clients and employees. Shipping on these gift packs is always free when your recipients use their gift certificates . Just visit our pheasant for dinner site and place your orders. The more gift packs you order the more you can save in costs while providing a unique and delicious alternative to the typical gift packs available at the grocery store! Don’t hesitate to order one or even a couple corporate gift packs if you have fewer people to surprise with a beautiful,unique gift. Let me show you some of our corporate gifts packs at both the executive and premier level, to get you a little more excited about appreciating your employees and clients with a gift from our online store. 10 Tasty Ways to Enjoy Pheasant! Most of the time, I have focused on sharing recipes when I write posts for this blog, but today, I decided to focus on 10 of my favorite types of pheasant that can be bought through our retail store in Janesville or through our on-line store. Grilling Time For Pheasant Lovers! You can purchase our whole pheasants at our retail store on HWY 51 in Janesville, WI or at our online store. I promise you that a pheasant from MacFarlane Pheasants will be delicious! More recipes are available in our free downloadable cookbook. There are many ways to prepare pheasant and the recipes in our cookbook are all tasty. If you look through our blogs you can learn about some of my favorites. Lisa Erickson shared her delicious recipe for pheasant breakfast sausage with MacFarlane Pheasants, which is one of the many recipes included in our free cookbook. You can use either pheasant legs or pheasant breast to make your sausage. I personally like the boneless pheasant breast for this recipe, because it is easier than pulling meat off the bone! Either way the sausage is delicious. If you have friends visiting this summer and want to impress them at breakfast, this is the sausage for you! This is our only breakfast recipe in the cookbook, but there are many recipes for appetizers, entrees, soups, and salads that are tried and true! If you have never tried pheasant or if it is one of your favorites, I can guarantee that these recipes will have you wishing for more. 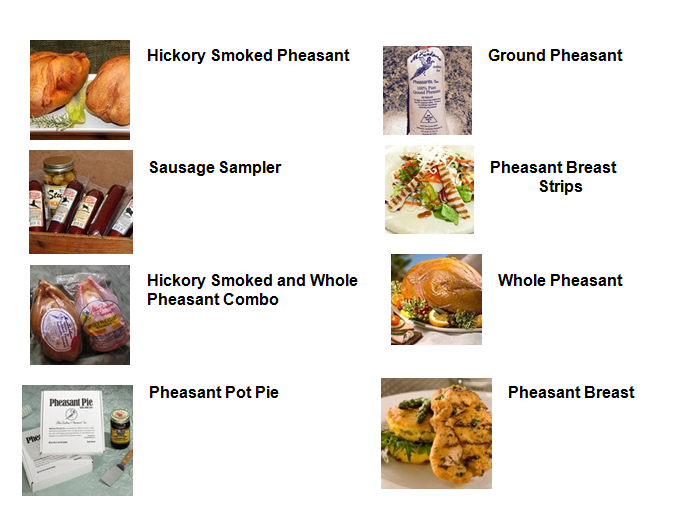 You can order the pheasant meat from our online store or by visiting our store on HWY 51 in Janesville WI. Grab your food processor and give this recipe a try. You won’t be disappointed. Spicy Almond Pheasant Soup Is Super Healthy and Delicious! What I like best about the spicy almond soup recipe is that it is such a healthy combination of vegetables, low fat pheasant meat, and nuts. These ingredients are well known for their nutritive value, but every ingredient in this soup has health benefits. The jalapeño peppers are low in fat and sodium and an excellent source of dietary fiber. They also provide the vitamins A, B1, B6, B12, C, K, potassium, copper and manganese. The ginger is known for its anti-inflammatory qualities. Even the sprigs of parsley are an excellent source of folate, iron and vitamin K and C. When you put the ingredients together to make this soup, you will not only find it mouth watering but your body will thank you for all the extra nutrition when you eat it. Lisa Erickson provided us with this recipe and you can find it, and many other delicious recipes, in our free pheasant cookbook.Don’t forget to download it when you finish checking out this awesome recipe. All of the pheasant meat we sell is USDA certified. This certification assures our customers that our white pheasant meat is top quality from the cutting board to your table. We thought you might enjoy reading about the processes we follow to prepare our pheasant products for the stores, restaurants, and individuals who buy them. Joe Tegethoff sent us a recipe a while back for a delicious entree that is made from one of our best-selling products-pheasant breast. Our pheasant breast is sold in two different sizes.There are 6-8 oz. packages of pheasant breast with 4 lobes in each package or 4-6 oz. packages with 4 lobes in each package. For this particular recipe,you will need one pound of cubed pheasant breast, so either package will work.The added benefit is that you will have enough left over to make another dish from our free cookbook! Please download it from our link and let us know which recipes you try by clicking on our Facebook icon at the top of the page. Enjoy this delicious and healthy Pheasant Sweet Potato Pie! I was browsing through our recipe book this weekend and noticed our Drunken Pheasant recipe. It is so appealing, I decided it was worth featuring in our blog. This recipe is perfect with garlic mashed potatoes or rice and your favorite green vegetable. I enjoy preparing it for guests because it doesn’t keep me in the kitchen all evening, but tastes like it did! You can purchase whole pheasant online or at our Janesville Retail Store at 2821 South US HWY 51, Janesville, WI. Now, lets get to the good stuff-Drunken Pheasant! MacFarlane Pheasants has lots of game meats to help you create unique Easter baskets. If you don’t want to create your own basket, why not purchase a gift pack for your special grown up? We have a Multi-Game Pack that offers a variety of game meats, put together especially for the daring! You can purchase elk, alligator, quail, buffalo,venison, duck and our own farm grown pheasant, in our store or online.Obviously, pheasant is our specialty, but pheasant lovers have been known to enjoy trying other unique flavors. Take a look at some ideas in this article and then be sure to visit pheasantfordinner.com for more information about our game meats and so much more. We have delicious recipes featured in our blog posts and all of our favorite game meats available. The holiday celebrations are over and it is time to think about eating healthy in 2017! When I think about eating healthy I always think pheasant! Did you know that pheasant is even healthier than chicken? A pheasant leg is 134 calories. A chicken tender has 263 calories. The pheasant leg is also higher in Vitamin A, Vitamin C, Calcium, and Iron. Let’s see, that means I can have a glass of wine with my pheasant and it adds up to about the same amount of calories as one chicken tender. I’m convinced! Actually, I think we could do even better than that in our quest for healthy eating. Our cookbook has some delicious salad recipes that will offer you healthy protein from pheasant but also some other yummy ingredients to help you eat healthy with a smile. I’ll share one of our recipes with you right now, but be sure to download our cookbook to discover more healthy pheasant alternatives. Visit our online store or our retail store in Janesville, Wisconsin to make your pheasant choices. Here’s to making 2017 a year of healthy choices! I don’t know about you, but the holidays seem to bring out the gourmet chef in me! We have scaled back on gifts at my house and have been splurging on having a pot luck of delicious foods. Pheasant has been a frequent request! I have served it baked with rice, in a pheasant pot pie, a pheasant pizza, a pheasant salad, and even on the grill. This year I am serving pheasant brats. MacFarlane Pheasants has a great selection of brats that can be ordered from their online store.The brat flavor I am excited about for my holiday gathering is made from pheasant meat, pork and Swiss cheese! I expect it to be a real treat and I am NOT offering buns. I want friends and family to taste the full flavor of this delicious pheasant. If you are looking for an easy gourmet delight for your holiday gathering, check out the online store at MacFarlane Pheasants. Be sure to download the recipe book for delicious recipes with pheasant. It’s free! Have a gourmet holiday and a grand new year! You Just Cannot Go Wrong With Pheasant Pizza! After you try this pizza recipe from our free online cookbook, I’m sure your mind will begin spinning even more ways to create a delicious pizza using MacFarlane Pheasant. Pheasant Pot Pie is a Fall Favorite! There are many ways to enjoy pheasant pot pie this fall. We offer a delicious frozen pot pie in our retail store that you can bake and serve without doing a speck of preparation. You definitely won’t be disappointed. 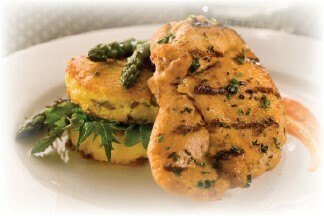 You can also try Chef Mark Mancuso’s gourmet recipe featured in our free online cookbook. Pheasant pot pie is one of those comfort foods that is perfect for this early fall weather. I couldn’t resist trying my own variation of pheasant pot pie made with MacFarlane pheasant breasts. So regardless of your choice of pheasant pot pie, we hope you will enjoy this comforting dish, soon! Who Wants to Shop on a Pheasant Farm? If you want to find a large variety of cooked and uncooked pheasant, a variety of exotic meats, or just a gift for someone special, you want to shop at MacFarlane’s Pheasant Farm! The store has been part of the farm since 1986 and the products offered have always appealed to folks within driving distance of the farm and area visitors who want to take a unique gift back to their hometown. Sarah Baker works in the office at MacFarlane Pheasants and it is her job to keep the inventory stocked for our visitors. She said, “In addition to our pheasant products, our guests can buy rice, jams, mustards, and everything from gifts for avid hunters to ear rings!” If you have a new idea for a product you would like to see offered, be sure to say hello to Sarah and share your thoughts. ECHO (Everyone Cooperating to Help Others), in Janesville WI, held a fundraiser on Saturday evening, September 24, 2016, at the Janesville Country Club. MacFarlane Pheasants donated the pheasant for this “Culinary Delight” and Chef Kevin Halpin created pheasant hors d’oeuvres consisting of breaded pheasant pieces, cold pheasant salad bites, and pheasant pizza. The dinner included a honey pan fried pheasant breast with a spicy sauce that was out of this world. Steak, salad, vegetables and cheesecake completed this delicious meal. This culinary delight raised some much needed funds for community members who are struggling with basic needs. This recipe comes from our Pheasant Cookbook which can be downloaded from pheasantfordinner.com. Ground Pheasant and many other pheasant products are available either on-line or from our store at 2821 South HWY 51, Janesville, WI. MacFarlane pheasants can also be found coast to coast at grocery stores and restaurants. 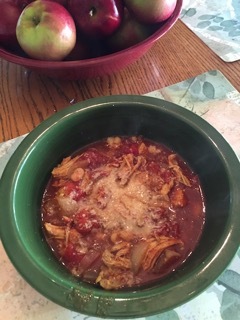 I have a new chili recipe for all my pheasant friends who have so many tomatoes they don’t know what to do with them. It has been a bumper year for tomatoes, so while I was looking for a way to use up these delicious tomatoes I decided to experiment with shredded pheasant, fresh tomatoes, and other garden fresh ingredients. Once again, pheasant is just the right ingredient to make a delicious and nutritious meal. New Pheasant Brat Flavors Coming Soon! We have been offering brats for a year or so, but recently we began working with Wilson Farms processing facility to develop a flavor profile for every palette. We provide bulk boneless pheasant breast to Wilson Farms and they make up our brats! Flavors range from sweet and spicy to smoky and savory. Pheasant Lovers Enjoy Finding Other Game Meats at our Retail Store! It is absolutely true that pheasant is the mainstay of our business! But if you have a taste for game meats, you can order your pheasant meat and several other meats at the same time. We have often mentioned that pheasant is a nutritious and low fat meat choice. We also offer alligator, quail, buffalo, elk, and venison at our online and on-site store at MacFarlane Pheasants.These meats are lower in fat than beef, filled with nutrients, and full of flavor. We have an outstanding selection of gift baskets at our MacFarlane Pheasants’ on-line shopping store that include free shipping within the continental United States. What better way to give a unique gift for any occasion without worrying about shipping charges? Food items are the perfect gift for friends with discriminating taste. These tasty baskets will impress your friends. Have them visit our pheasant for dinner website to look for free great recipes after they check out their gifts. This is the third year that our farm has entered a cooking contest at an event called, Party at the Pitts, hosted by Diane Hendricks. This event is a yearly fundraiser for Janesville’s own Kandu Industries. Kandu creates opportunities within the community for persons with disabilities or disadvantages and it gives us great pleasure to support them. Can I Serve Pheasant Without Cooking It? I love pheasant but I don’t always want to cook. Is there anyone else out there with the same thought? The first time I tasted pheasant it was served with crackers, fruit, and cheese. The pheasant was hickory smoked pheasant served with two types of dip-mustard and a horseradish sauce. I couldn’t stop going back for the pheasant. The taste was so unique and flavorful. I asked my hostess how she had prepared the pheasant, thinking it must be a complicated endeavor. You can prepare pheasant in the oven, on the grill and in the crock pot! Sometimes when you are preparing for a summer picnic at home you need to prepare a variety of dishes. You can save yourself some time for other taste delights and still serve MacFarlane Pheasants! Just try this simple crock pot recipe for six. I recently served this dish with brown rice, a cucumber and tomato salad and fresh bread. It was scrumptious! Every dish tastes better with pheasant! Time for a Pheasant Barbecue! Did you know that MacFarlane Pheasant has many choices of pheasant products that can be prepared on the grill? After you decide which grilling technique you would like to use, visit our on-line store or our retail store to view the many choices we have available. On-Farm Retail Store at MacFarlane Pheasants Offers Yummy Food Choices and Unique Gift Items! MacFarlane Pheasants’ Retail Store is located at 2821 South U.S. Hwy. 51, Janesville, Wisconsin 53546, in Southern Wisconsin. We would be proud to show you our food products and gift items, in person, when you’re in the area. We love to meet our customers and show them around. Just ask for a farm tour by calling us at 608-757-7881 and we can be ready to show you around when you arrive. White Chili With Pheasant Hits the Spot! Last week we introduced pheasant poppers and promised Heidi Green’s white chili pheasant recipe to complete the meal. You won’t be disappointed when you MacFarlane’s pheasant breast to make this flavorful chili! Add poppers and bread to complete this wonderful end-of-winter delight! Our Fabulous Pheasant Meat Is Everywhere! MacFarlane Pheasant reaches grocery stores and restaurants through food distributors who sell them to either smaller distributors or straight to restaurants and grocery stores. We work with Harris Teeter, Burris logistics, and Lipari foods. The main products we sell through these distributors are whole birds, the half pheasant, and the airline breast. January 2016 is the first anniversary of our newest pheasant product: boneless, skinless pheasant breast, which has become a best-seller this year. This easy-to-prepare, healthy, and cost-effective delicacy is a great choice for home chefs or professionals because the prep work has been done for you. Looking for a Healthy Alternative to Chicken? MacFarlane Pheasant highly recommends pheasant for entrees, soups, hors d’oeuvres, tacos,enchiladas or any dish of your own creation. Pheasant has a unique, rich flavor that makes any meal a special occasion! Find out the Best New Restaurant Serving MacFarlane Pheasant and Meet the Chef! We are proud to recognize Chef Phillip Rodriguez at Graft Madison in Madison, Wisconsin. One of the dishes he prepares with exceptional expertiseis pheasant from the MacFarlane farm. Let me make your mouth water bydescribing his preparation of this dish! MacFarlane Pheasants was proud to participate in the ECHO fundraiser, Empty Bowls, on October 24, 2015, at Parker High School, in Janesville, WI. Homemade soups and artisan breads fed more than 600 guests. The 45 different soups served were provided by 35 local restaurants and MacFarlane Pheasants! Looking for the perfect holiday recipe to make for your guests this holiday season? This pheasant and rice recipe is sure to please. Thanksgiving is celebrated on November 26th this year so it is the perfect time to download our cookbook at www.pheasantfordinner.com. You can purchase your pheasant either raw or fully cooked but either way your guests will be impressed by the unbelievable taste of this game bird. Why not WOW your guests with this recipe from our cookbook! Fall is a busy time at MacFarlane Pheasants, Inc.! September through December are the months when we have the most sales, both at our retail store and in wholesale. We rely on our team effort to make the holiday season a success. Our office and shipping department are working hard and staying organized in order to be sure our food products are ready to be sold and shipped. Summer is over and fall is now upon us. Football season is in full gear now so let’s talk tailgating! If bratwurst is your 'go to' choice for tailgating, MacFarlane Pheasant Brats are a great alternative. Remember, our pheasants are fed natural grains, no antibiotics, hormones or animal by-products. When we process the meat, we don't inject it with water to bulk it up. Pheasant has a lot of mystique behind it. I wish I had a dollar for everyone who asks me if I could make them “pheasant under glass”. This idea makes it seem that pheasant is difficult to prepare. Using our tips, recipes and ideas for preparing and serving our product, you will find that pheasant is fun to prepare, and delicious as well. As it stands, MacFarlane Pheasants pheasant meat and meat products are distributed nationally. You can also find our whole pheasants in Whole Foods (get it?) across the country. Of course, the full range of our products are available online, and then there’s our retail store in our hometown of Janesville, Wisc. There are numerous ways to find our products, wherever you might be, along with numerous products. Whether it’s tailgating or fine dining, pheasant is always appropriate. I find that people are always looking for a bargain, a way to cut costs, or get a good deal. If we can combine delivery orders we can lower our rates, and our customers are happy. If we have a sale on chicks, our phones are active all day. People want a good deal. If I told you that you could get pheasant breast meat for about half the price that we normally charge, wouldn’t you want to get in on that? I know restaurants need to pay the bills, and the cost of the food they serve is one of their biggest expenses. MacFarlane pheasants has a deal for you.